IWCS: The International Wood Culture Society is a non-profit organization based in Los Angeles and since its establishment in 2007, it has been focusing on research and education of wood culture, promotion, We are engaged in activities such as international symposium of tree culture and documentary etc. 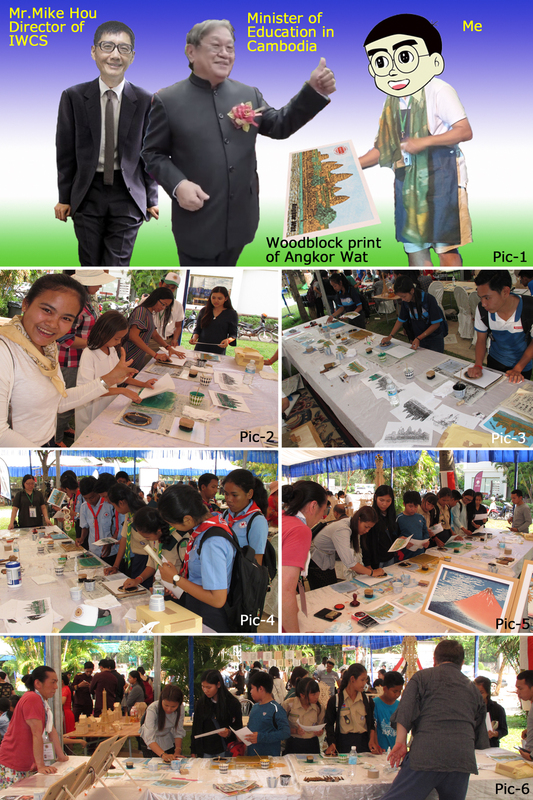 From 2013 to March 21 every year on "World Wood Days", we have held tree cultural events around the world as below, entitled "World Wood Day". IWCS has been asked to participate in World Wood Day from 2017, focusing on traditional woodcuts as one of the tree culture. Below is a record of the participation record. 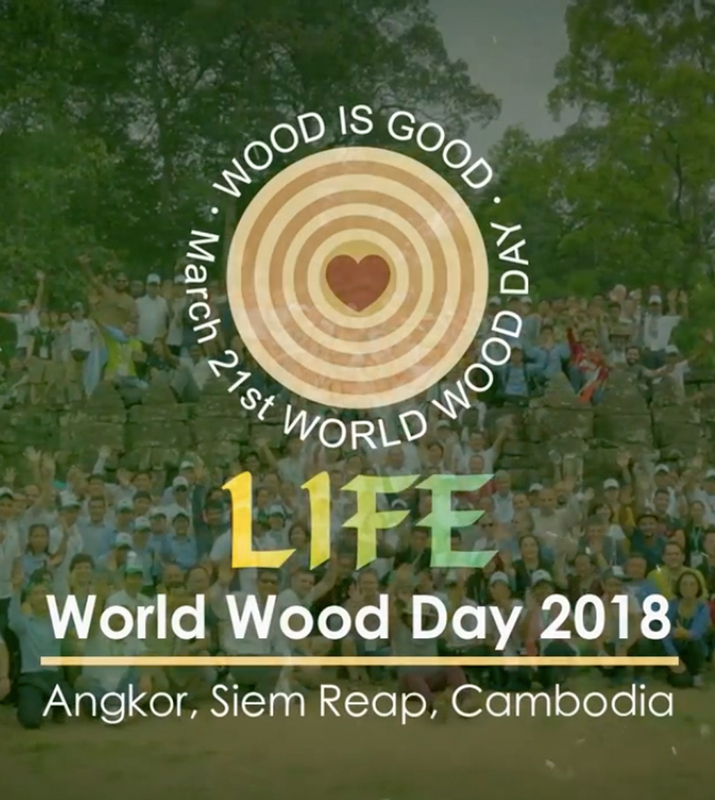 Please have a look at the World Wood Day 2018 exhibition video. After I was invited to the WWD 2017 last year in Los Angeles, this year, I was also invited by the International Tree Culture Society (IWCS) to do overseas expeditions. The destination was "Angkor Wat" in Cambodia, famous for world heritage. So we were participated in the World Wood Day 2018 from March 19th to 27th (including traveling days). 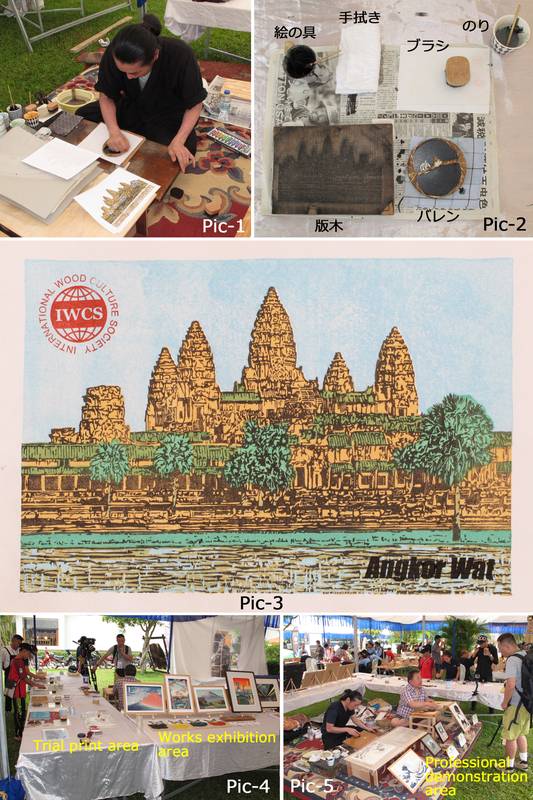 This year we also demonstrated the traditional woodcut with Mr. Sekioka of the sculptor and Mr. Okada of the slinger, but this year IWCS also gave a new special mission. 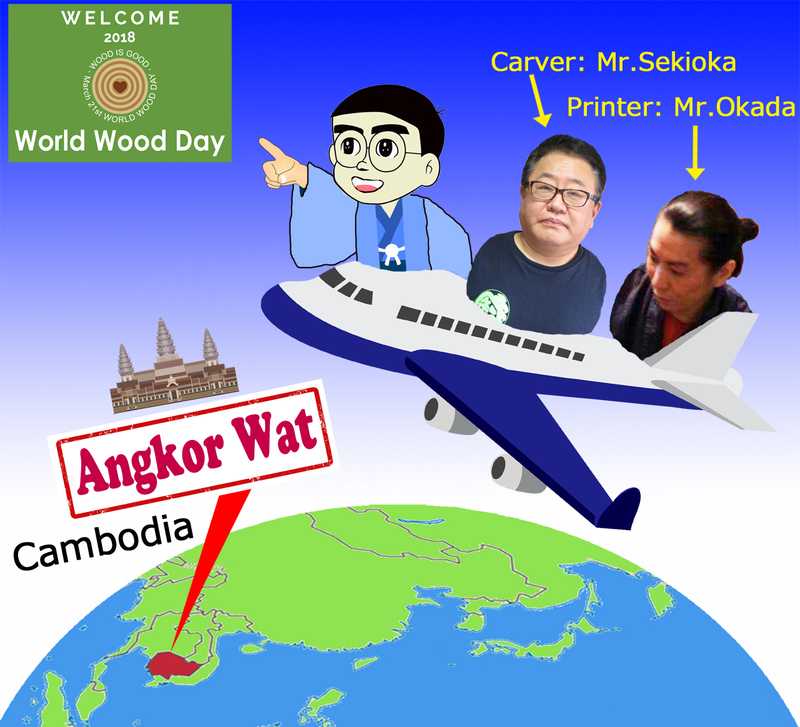 Completed the mission of World Wood Day (WWD) 2018 and returned safely from Cambodia today (3/27). I have experienced so many things, I was too busy and could not take the time to introduce my progress in a timely manner. However, although everything will be reported afterwards, I would like to introduce the Cambodia expedition this time in several steps. 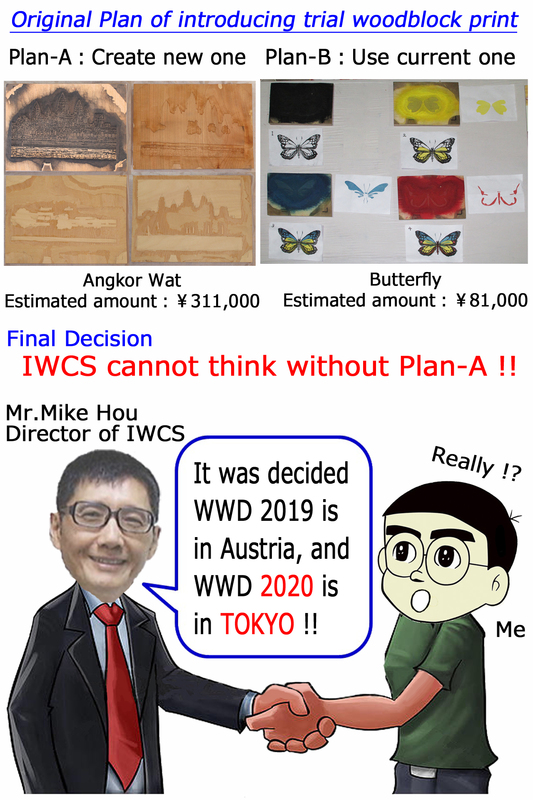 It was at the end of January when I was asked to participate in WWD 2018 from International Wood Culture Society (IWCS). As well as last year's event, in addition to doing a demonstration of a sculptor / slinger, this time as a special effort, I was asked to do a hands-on experience. Although it is a card size, I trimmed the photo of Atsuta Shrine, designed it for woodcut prints and shared information with IWCS that I can do woodcut printing based on the traditional woodblock technique. 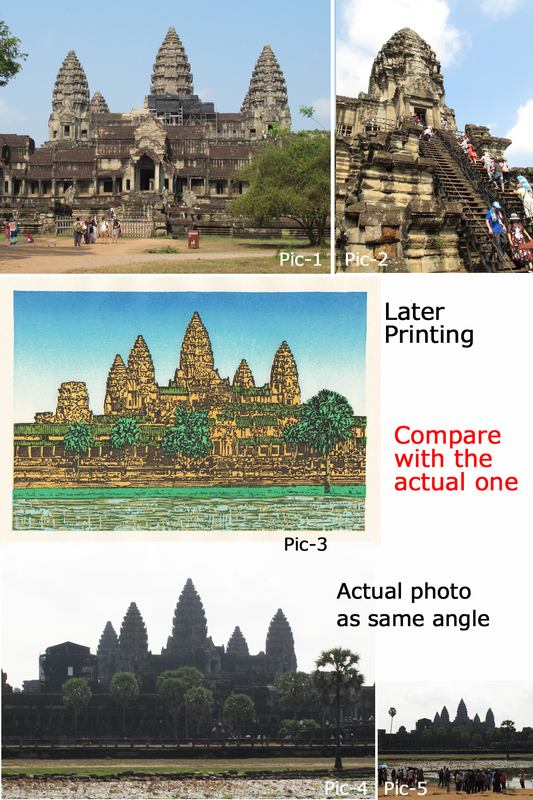 Therefore, this time it was a request to do designing based on the photograph of Angkor Wat in Cambodia, making traditional wood prints, and using it to do a hands-on experience. However, the size of the screen increases to about B5 size, the engraving work expenses also expands, and exclusive tools and parts necessary for each step of the experience work are also expensive, even if they are all burdens of IWCS It was at the end of February that I decided to do. Then we proceeded with preparations for them at a tremendous speed, but in order to experience riding even by amateur visitors, the woodblocks were designed with a simple 4-piece construction and all necessary tools and parts for 4 steps were also prepared. On March 18th, so very late and close to the departure day, all four edition trees were carved up. On 20th all preparation were completed and we had a very hot summer day with over 35°C during the day in the outdoor exhibition. Each booth was under big tents, what were joined with multiple other big tents The fight against the heat has been started! First, because woodcut prints were strictly prohibited from direct sunlight, we placed and replaced our booth, which was originally placed at the edge of the tent, to the back of the tent. Next, I raised the floor of the craftsman's work but I prepared it in another way than last year. First of all, we procured a large number of bricks (blocks) as the foundation locally, the boards to be placed on it were diverted from the table board, and furthermore, on top of it, the rugs borrowed from the hotel were laid and completed . I was about to arrange a table around it and trying to create a work exhibition and slide experience line, the clouds suddenly became suspicious. Although it was before the rainy season, a lot of rain started. The rain fell downwards at the boundary between the tents, and it was discovered that rainwater was accumulated on our booth, and we needed to drain it. On 21st, the rain has stopped, and the day started with an opening ceremony. Unlike last year, a lot of outside news photographers came this year. This year, Cambodia seemed to support the event by raising the country, it seemed to be because the national VIP was invited as guests. However, because the booth was not ready, we dropped out of the way and headed for the event venue, preparing for the rush. IWCS mark and Angkor letters are stamp compatible. We put these in the final step (4th step), so that the experienced person can press the position freely after completion of sliding. Mr. Okada's paint of each process, 4 pieces of scrub trees carved by Mr. Sekioka were placed in each process, and the experience line was completed. 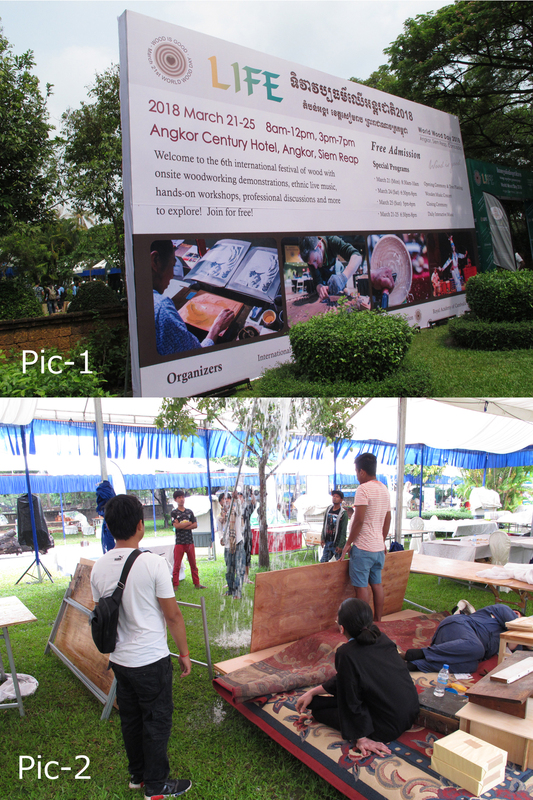 Next, the exhibition area of ​​the work, the demonstration area of ​​the craftsman was completed. When the opening ceremony finished, guests visit one after the other, so some preparation were completed just in time, and full-scale operation has finally started. When I started full-scale operation, somehow some African colleagues came near to our booth. As I later learned, it was at the opening ceremony that the press clubs surrounded the VIP, the current minister of science in Cambodia, the former president of Nepal, who also came to our booth. After that, we finally got ordinary visitors and had an experience of rubbing while explaining, but everyone was delighted when it finished to Angkor Wat as it was. After a while, another unusual group came to our booth. It was an interview from a TV station in Cambodia this time. I received and answered about 5 questions, I had paid various images to the camera, but I did not have time to watch the local TV, so it is unknown what kind of video eventually flowed on TV. The work process is split into 4 steps. Multiple person are able to run through the process side by side. The guidance of her was over in 5 minutes although she was able to move as instructor immediately. Then, it came to finally turn well. Besides her, the instructor became a member of several staff members. I also enjoyed teaching at the manager's class (Charlotte Lee), but I practiced guidance once (Pic-5). Because the IWCS staff were also busy with other things, it was difficult to stay always at our booth, and in the end Yu Wen has become the most reliable assistant. 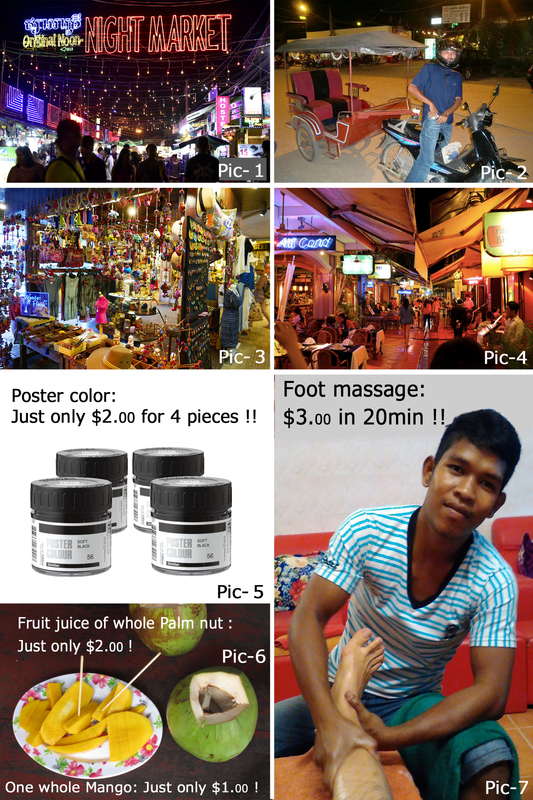 At the night market were a lot of open souvenir shops, restaurants with all kinds of food, bars sundry shops and massage shops. Also, with the hard standing work everyday, my feet became frank. Also walking was just a pain, so I tried "foot massage" on a trial. It was only 3 dollars on both feet in 20 minutes (Pic - 7) After that evening my feet tired all the time and the effect of marvel continued. As this night market, security is not bad, there are wonderful Cospa, so if you put up with the hot we think that it is a very good tourist destination. In making the design this time, it was decided to be Angkor Wat with the staff, as a cambodian people seemed to like it, with a tailor-made idea, but it seemed that it was amazed at the key points of visitors. In this way, I was teaching in the guidance until the end of the last 5 days of the event period. After all, I do not know the exact number how many people have experienced, but I think that it may be 550 to 600 people (although there are many discarded papers) from the number of used paper I will. The closing ceremony was scheduled from the evening on the last day of the event, but the staff asked me "Please sit at the front so I'm going to stage." Inner, can you get something? 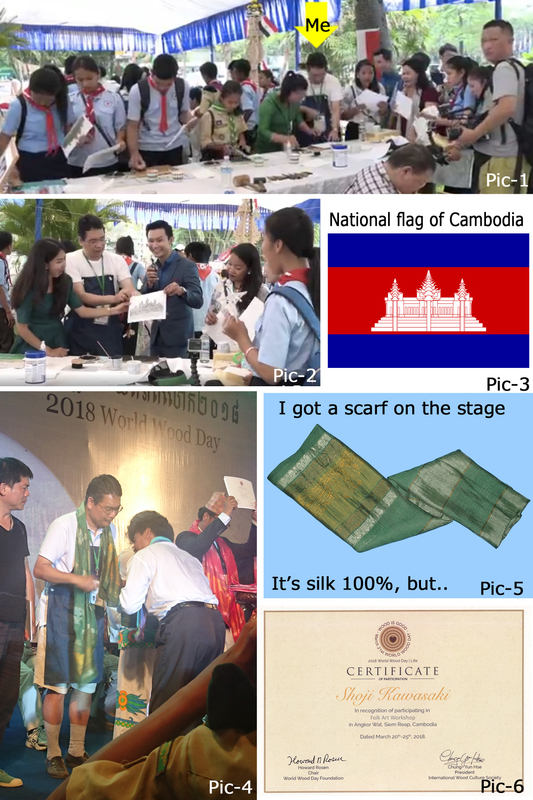 I also expected, but what I got up to the stage was a picture scarf with a silk 100% Angkor Wat and a certificate of completion. (Pic-4 to 6) Neither was "extraordinary" to say that. In the first place, IWCS is an NPO, because it is a nonprofit group that sells at this event and also keeps a certain group as a tough priority. Even so, in the event where more than 100 countries participated, only seven people were raised to the stage, so IWCS 's unique "stylistic appeal" was felt. The moment I received this scarf and certificate on stage, "I made my first custom made woodblock successful! 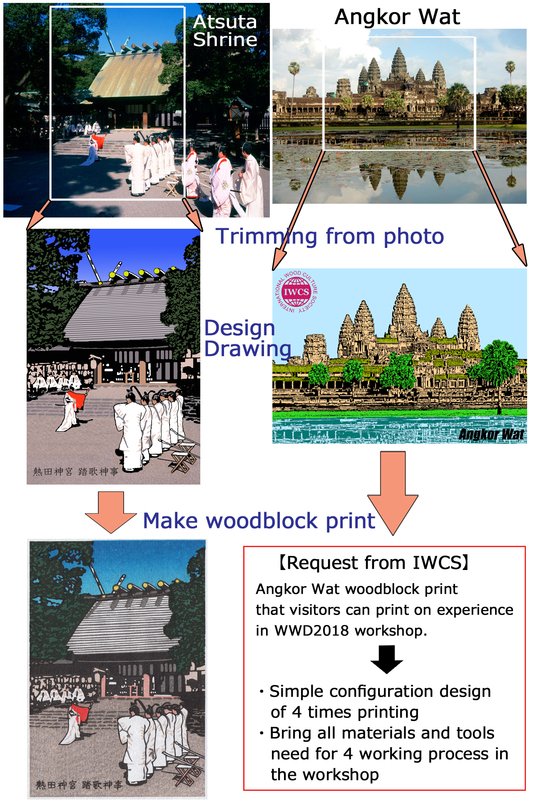 I was convinced that it was "
This time, I made a custom-made woodcut print of Angkor Wat for the experience, but initially, can I make woodcut prints for hands-on experiments from IWCS staff in charge? It was a fairly vague request of the order. In addition to being able to bear all our traveling expenses and preparatory expenses, IWCS said that he intends to bear the cost of preparing this handwritten woodblock print, and that he would like to get a quote first. In addition to the tools required for each process, such as dedicated valle and brush, there are great differences between when creating a new log (Plan-A) and when using an existing product (Plan-B) It estimated 311,000 yen, the latter is 81,000 yen. Although Plan - A was expensive, it had the advantage of being able to make original things according to the event, but there was also a story that the person in charge wanted to tell me about Plan - B in detail, so that it would be Plan - B I was thinking. However, the final decision was finally given for the first month before departure, but the answer was "what other than Plan-A can not think". The event ended with great success thanks to that, but I was wondering who decided that decision to the end. It was the day after the end of the event, that is, my return home, but by chance I met IWCS general manager Mike Ho in the hotel lobby. I also tried to talk about this as a greeting and asked if Mike was not making this decision. Then the answer was 'YES'. 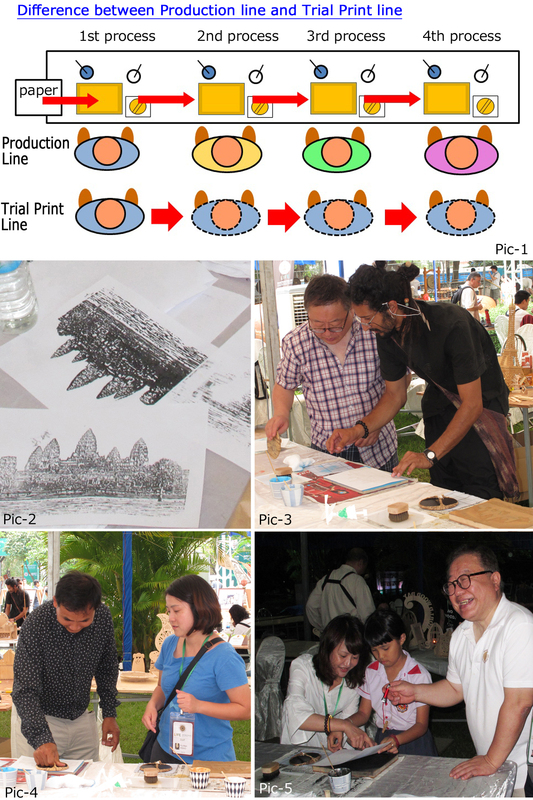 As I mentioned to Mike, "I am very grateful for making a new trial called custom made woodblock print," Mike shook hands with me and said, "I did an experiential event with that woodcut print Thank you so much, really thank you! "On the contrary very much thanked you. Regarding future World Wood Day, I was happily spoken to say, "I will be decided in Austria next year in 2019 and Tokyo will be finally decided in 2020 after the coming year." Yes, it seems that 2020 will be held in line with the Tokyo Olympic Games, we have been planning to do so from now on, so it is said that it was decided at the end as we proceeded with the adjustment with the Japanese side. I felt it obsessed that this person was not the one of us. This year's World Wood Day seems to have participated more than 120 countries. Besides traditional woodcut prints from Japan, there are participants of Karakuri crafts and paper craft, there are participants of the students of Monodzukuri university, and I became a close friend to everyone. I would like to introduce the booths of those people and booths of people from other countries, but this time I was busy with too many visitors and I could not afford to take even the pictures of other booths. However, a very nice video was edited from IWCS, so please take a look at it. Unfortunately, because my booth was in a panic state or not, it has not been paid here but, except it, it is finished in a very good video that really understands what this event was like. During the 5-day event, all the participants went to see Angkor Wat and planted trees nearby. Of course, if you come in the afternoon you may have seen a better landscape, but the circumstances of the trip will not go so far. As I had no opportunity to come only this time, obviously, wood prints that slid properly were much better than the actual ones. I had a valuable experience that "woodcut prints made are beyond the actual thing". Because the one that increased the friction at the site was presented to the person who did not slide well, because no sample was left. Since the technique of Mr. Okada is also added, it can be said that it is a grade-up version because the increase in slide after returning home is added. I am about to send this to Taiwan for IWCS members who took care of me now.